Staffmembers at The Joule School in Cedar Park, just north of Austin, join us on the blog today to explain the school’s approach to National Novel Writing Month and the ways it has changed how its young students view writing, entrepreneurship, and themselves. When first-grader Ripley Martinez walked into a school assembly, she had no idea she would soon be showered in cash. Within 30 minutes, she was jumping up and down with joy as $76—all her own—rained down around her onto the floor. That's how much Ripley made selling her novel since last November. You read that correctly: a 5-year-old had written and marketed her own book. Even more impressive, Ripley’s book, Lollipop Girl in a Lollipop World, had just broken the school’s record for number of copies sold. She was surrounded by cheering classmates engulfing her with hugs, and her teacher was crying with pride. The Joule School, a progressive K–8th private school in Cedar Park, participates each year in the National Novel Writing Month (NaNoWriMo) Young Writers Program. You might be familiar with the adult competition, in which anyone can attempt to write a 50,000-word novel in 30 days. The NaNoWriMo organization offers suggested word-count goals and a certificate for grade-school students who complete a modified version of the competition. The Joule School does NaNoWriMo in a big way. First, it raises the bar—increasing the word count minimum for their students by up to 3,000 words per grade level. Suggested word-count goals for Kindergarten, when Ripley wrote her book, range from 20 to 200 words, but she was encouraged to hit 500. (This is equivalent to the “advanced” category for second-grade students in the national program.) If students rise to the challenge, Joule celebrates by arranging to have their hard work published and placed for sale on Amazon. Then, at the beginning of every November, authors from the previous year are recognized at an awards ceremony and handed cold, hard cash—their royalties from a year’s worth of online sales. Ripley’s novel is about “a candy girl adventuring and finding her friends,” according to the young author. When asked where she derived her inspiration, she said simply, “Candy.” (A glimpse into the mysterious creative processes of a visionary.) Her teacher, Meredith Allen, said Ripley was encouraged by meeting—and then exceeding—her incremental word-count goals. All over the school, individual floor-to-ceiling progress trackers (similar to a fundraising thermometer) were plastered on the walls. At the end of each day, Ms. Allen would type up her students’ handwritten work and let them check their totals. (Incidentally, this is not unlike Margaret Atwood’s writing process.) She says the students felt gratified when they used the word-count tool to see how much they had accomplished each day. It quantifies their success in a way that is readily accessible to them. The Joule School’s approach to NaNoWriMo develops more than just literacy skills. As the students complete the process, they learn about gross versus net income, active versus passive income, marketing, and other elements of entrepreneurship. The entire student body, from three-year-olds to eighth-graders about to matriculate to high school, can opt in. Ripley’s novel grossed $285 in 12 months, but she knew she would have to pay publishing costs and taxes. She also knew that the money she would get on November 1st was all her own, free and clear. What better way to teach a young child about net profit? These days, Ripley often chooses her own book to read as her bedtime story. In doing so, she generates new ideas and thinks of ways she could improve her writing. One year later, she’s decided to tackle a more complex subject: this November, she’s working on a rags-to-riches tale of redemption about a young girl living in poverty. Soon, you’ll see it on Amazon. Soon, you might just see a young girl around town asking you to buy her second book. Is it ADHD or a kinesthetic learning style? Continuing our summer mini-series on learning styles, I’m pleased to share this guest post and video from Madison McWilliams, who runs The Joule School. This unique program is now enrolling for Fall 2014. At The Joule School, we serve students who are considered bodily-kinesthetic learners. These are children who learn best when they are allowed to engage their hands and feet as well as their minds. To some, there may appear to be an overlap between these children and those who have been diagnosed with ADHD, a neurological condition characterized in part by hyperactivity (the need to move often and difficulty in sitting still). Introductory material on learning styles is available here, here, and here. In short, a learning style is the method by which a student takes new information and converts it into knowledge. Learning styles influence the entire educational process, including which strategies children use when studying for tests and the types of subjects that they prefer. 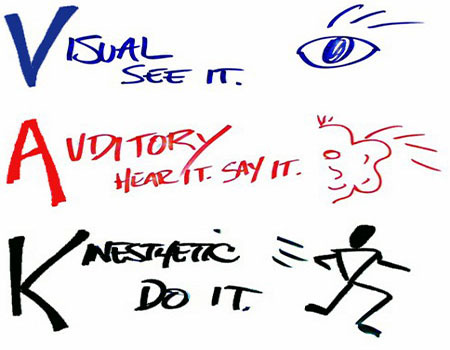 Many education experts recognize three primary learning styles: auditory, visual, and kinesthetic. A kinesthetic learning style is characterized by an ability to retain (memorize) information best when it is related to movement. When presented with new material at school, kinesthetic learners zero in on action that can be performed with the human body. They have an innate ability to copy movement and tend to excel in gross and fine motor activities such as dance, sports, art, or playing instruments. While telling a story, they will likely act out the scene or role-play while they speak. Kinesthetic learners function best in a classroom where they can role-play, build, measure, jump, sing, and experiment because all of these actions help them process information into long-term memory. walk to the pencil sharpener or bathroom an unnecessary number of times. interrupt the teacher or classmates. 1. When provided with a bodily-kinesthetic lesson, do the “ADHD symptoms” disappear or appear to be dramatically reduced? True kinesthetic learners will be able to stay engaged in a lesson that allows them to use their bodies. For example, a kinesthetic learner who is offered the opportunity to classify roots by movement and touch will probably be quite successful during the lesson and subsequent evaluation, because such an activity stimulates his or her mind. Students with ADHD, which is characterized by impulse control issues, may still find themselves distracted, fight the urge to disrupt or abandon the lesson, or have difficulty explaining what they are doing when prompted by a teacher to describe their learning. If a child is suspected of having ADHD because he or she struggles to sit still in class, stakeholders should try a kinesthetic lesson in a subject that the student ordinarily does not enjoy. (This is recommended because we all tend to concentrate better if we like the subject being taught.) If the student can remain focused during the lesson and retain the material taught, then it is likely that he or she simply has a mobile learning style. If the child completes the hands-on activities but shows little or no retention of the concepts covered, or seems far too stimulated by the hands-on environment to focus on the lesson, then an appropriate expert in ADHD should be consulted. 2. Do appropriate ADHD accommodations help the child focus or achieve in school? ADHD accomodations are designed for visual and auditory learners who need additional help to overcome their struggles with distractibility and hyperactivity. These children often retain material best if it is taught in a traditional format with traditional assignments, but they simply cannot focus on the lesson long enough for the material to sink in. There are dozens of research-based accommodations for these children. For visual learners, an appropriate ADHD accommodation might be a written checklist of tasks to help them organize and complete an assignment, which they can cross off as they progress through each task. Using audiobooks as a supplement to text-based materials can help hold the attention of an auditory student with ADHD. If appropriate accommodations are implemented and they facilitate gains in student learning, then the child may be a visual or auditory learner who simply needs assistance in focusing, and a specialist in ADHD can make recommendations for that student. I will leave you with a brief video I made to demonstrate one example of a simple and effective math lesson geared to kinesthetic learners. Please feel free to leave questions or comments below; I’d love to continue the discussion. * Nolan et al. (2001), Teacher reports of DSM-IV ADHD, ODD, and CD symptoms in schoolchildren, Journal of the Academy of Child and Adolescent Psychiatry 40, 241—249.